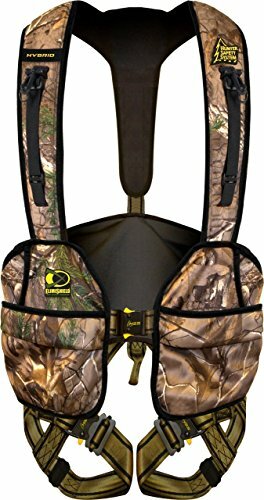 Hunter Safety System Hybrid Flex Safety Harness with ElimiShield Scent Control Technology (NEW for 2017), 2X-Large/3X-Large/250-300 lbs. Hunter Safety System has combined the best features from their two most popular tree stand safety harnesses to create the Hybrid. The Hybrid features the lightweight skeleton of the Ultralight with the convenient pockets and storage of the Pro Series. The Hybrid features six pockets for quick access to all of your essential gear and built in accessory straps to keep your binoculars right where you want them at the front of your chest. All of these features in a lightweight 2.5 lb harness, what more could a hunter ask for? Every fiber of the harness is treated with Elimishield technology which completely eradicates human scent. Hunt safely and confidently; knowing you will stay safe throughout the hunt and that big buck won't be spooked by any lingering scent on your harness. Features Hunter Safety System Size Information Men's Vest Sizing: Size Weight Torso S/M 100-175 Lbs. 28"-42" L/XL 175-250 Lbs. 35"-56" 2X/3X 250-300 Lbs. 48"-60" Men's Harness Sizing: S/M 100-175 Lbs. 30"-42" L/XL 175-250 Lbs. 37"-56" 2X/3X 250-300 Lbs. 48"-60" Lady's Vest Sizing: S/M 100-175 Lbs. 28"-42" L/XL 175-250 Lbs. 35"-56" 2X/3X 250-300 Lbs. 48"-60" Youth Vest Sizing: Youth 150-120 Lbs. View More In Emergency Response Equipment. If you have any questions about this product by Hunter Safety System, contact us by completing and submitting the form below. If you are looking for a specif part number, please include it with your message.